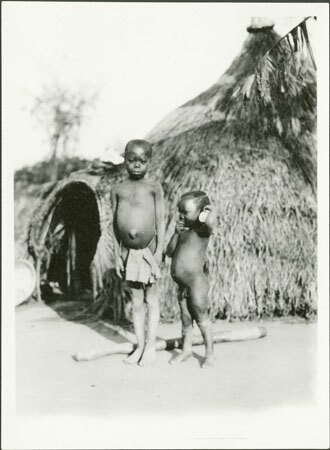 Two boys, one showing a slightly expanded abdomen (associated with malnutrition) and abdominal hernia, standing outside a hut with long eaves almost reaching the ground and a tunnel-like entrance way (probably a sleeping-hut for older children, possibly type known as barumai or dondomo). Morton, Chris. "Two Zande boys" Southern Sudan Project (in development). 03 Jan. 2006. Pitt Rivers Museum. <http://southernsudan.prm.ox.ac.uk/details/1998.341.293.2/>.